When I first met Jami on the Etsy forums I immediately knew that I had to show you all her shop Variation. 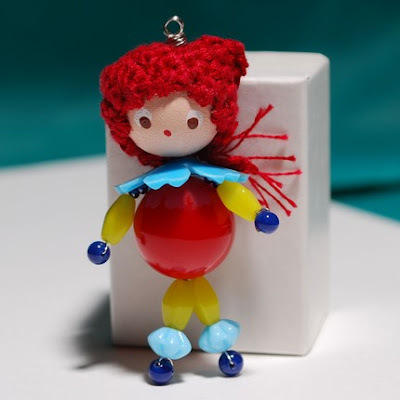 She specializes in beaded dolls that can be used as charms and pendants. 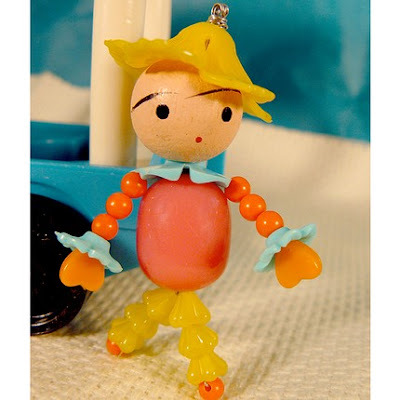 They each have fine details that add so much personality to these little creations. This little doll may be small in stature at a height of 2 1/2 inches, but it is full of charm! A hand painted face, along with vintage glass and Lucite beads and a crocheted head scarf all went into its creation. Please note this is not intended for use as a toy for children. 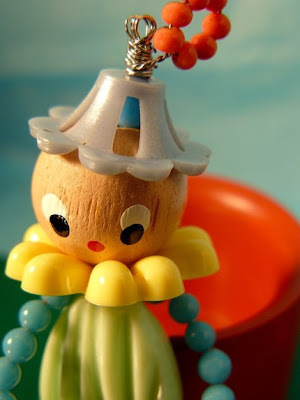 This little doll is ready for the summer with its aqua Lucite collar and yellow and orange beads. Use as a charm or a pendant by using the small loop on the top of its head. What is just as cute as Jami's beaded dolls? A post card featuring them! Measuring 5.75"X 4" it is professionally printed and the front is laminated. This cutie that came all dressed up for our blog giveaway! 1. Check out Variation. Come back and comment on your favorite item. These are all "too cute"! I really like the second one you pictured, reminds me of a "scarecrow". Cute little things! 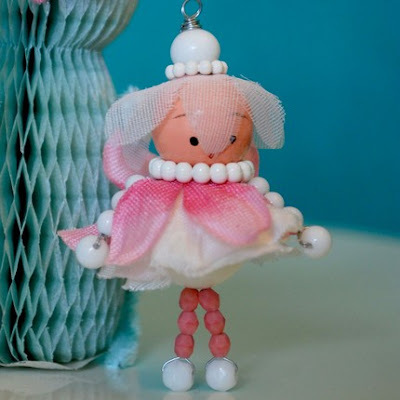 I love the Pastel Pink White Pale Blue doll ornament charm pendant, so soft, so sweet and so pretty! Thanks for the giveaway. I like the post card bead dolls. They look like a scene from a Guy Maddin film. I love the orange 60s style one with the long eyelashes. Adorable! Thanks for sharing about this etsy seller. I love the doll with the long eyelashes..and the one with the long red hair..hard to choose between the two..they're all adorable...thanks for bringing these sweeties to my attention! What great Christmas ornaments !! How to choose just one! I have come across Variations studio before and just fell in love! I love the postcards. I could think of so many wonderful uses! and oh, I'm already a follower! These are all adorable! Hearted the shop.